Rare Lucky charm, naturally grown Beads are found in forest of Aravali Mountains, India and are believed to be many hundred years old. They bring luck and ward off evil and Black Magic, & protect the wearer from physical harm by taking the abuse upon themselves. It is said the bead itself will choose its owner and will not stay with an unlucky person. They symbolise Goddess Lakshmi and it is said that the wearer is blessed with wealth and prosperity. 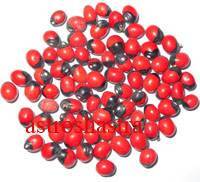 chirmi beads are considered very lucky from ancient times. It is kept in lockers, money boxes or purses. 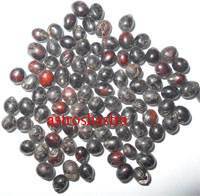 These Gunja beads have exclusive energies which protect us and bestows good luck and health. 1. 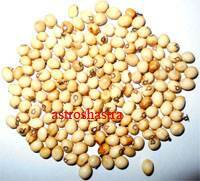 Since the Goddess of wealth, Maha Laxmi, stay near to these Beads they are kept in Lockers, money safe, cash box, altar, handbag, purse. 2. They bring luck and ward off evil and Black Magic, & protect the wearer from physical harm by taking the abuse upon themselves. 3. The Black Chirmi beads are used to ward off evil and removal of black magic effects, bring good luck and ward off physical harm. 4. They protect us from black magic or any tantric effects. 5. Keep them in silver box and place in cash box for abundance of wealth.